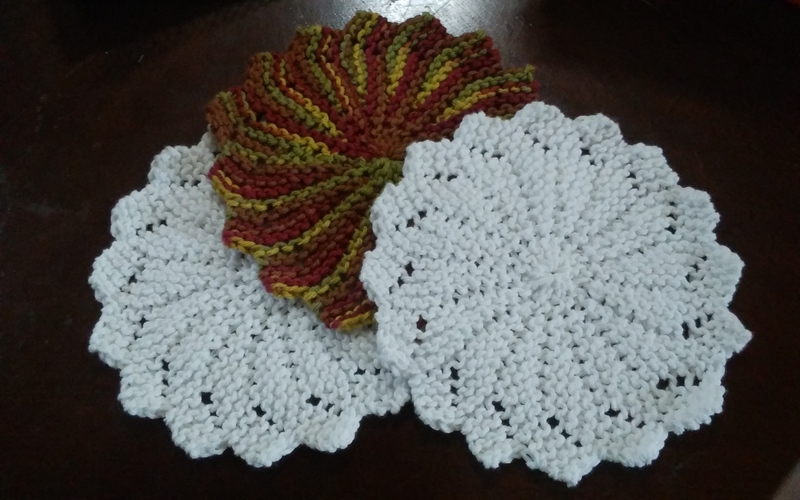 I made these using the pattern below with a few tweaks. Instead of a yarn over, I increased with a make one. 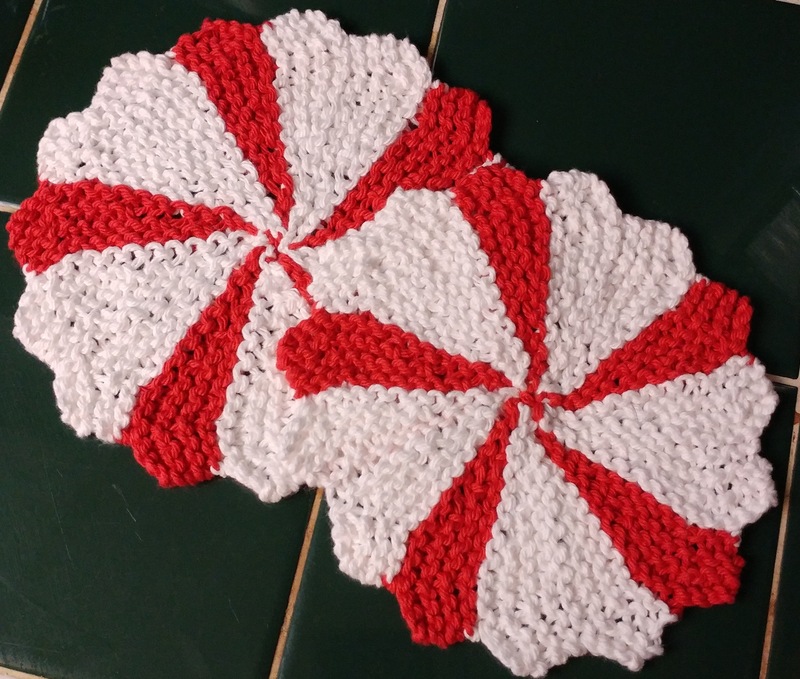 I started with the white yarn for one repeat before changing to the red yarn. After that I knit one repeat in red and two in white until I had 15 repeats. That’s one less than the pattern called for but it worked. The last white section is only one repeat so it makes two when stitched or grafted to the first. I have yet to figure out how to make the middle look nice. If you have any ideas leave them in the comments! Once I’ve washed these they come out about 7 inches across. Repeat rows 2-9 15 more times. Cut a long tail to stitch together the beginning and ending edges and then run through the bumps of the stitches around the center hole and cinch it up. Weave in the ends around and around through the center stitches. Start with a provisional cast on and skip row 1. On the last repeat stop on row 8 after casting off the first three stitches. Then put the first row of stitches back on another needle and kitchener stitch the two sides (there should be 12 stitches on each side). To kitchener stitch in garter stitch, which is a little different than doing it in stockinette, start by cutting the yarn about 4 times as long as the length to be stitched together. Hold the needles next to each other and using a darning needle, run the yarn through the first stitch on the needle closest to you pearlwise. Then run it through the first stitch on the back needle pearlwise. Run the yarn through the first stitch on the front needle knitwise and slip that stitch off the needle. Then run the yarn through the next stitch on the front needle pearlwise. Run the yarn through the first stitch on the back needle knitwise and slip that stitch off the needle. Then run the yarn through the next stitch on the back needle pearlwise. Repeat 1 and 2 until all stitches are off the needles. Here’s a YouTube video from KnittingHelp.com to get an idea of what this looks like. Run the leftover tail through the bumps of the stitches around the center hole and cinch it up. Then you can weave in the ends around and around through the stitches in the center. You are welcome to distribute this pattern and use the ideas included and gift or sell whatever you make from it. But if you distribute it, please do so as a whole, with attribution and this info included. Thanks! This work by Suzanne Lander is licensed under a Creative Commons Attribution 3.0 Unported License. “You can drive all day and still be in Texas.” From the Piney Woods in the east to the mountains in the west, the desert, plains, hill country, and ocean, there’s a lot to see in Texas. 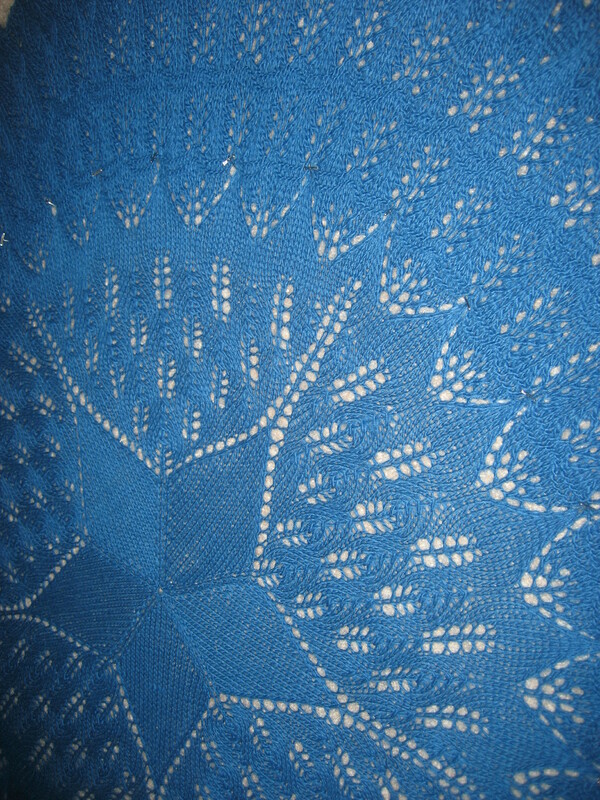 This pattern started for me with a curiosity as to whether I could make a five pointed star as a center for a shawl and continued on from there inspired by the different landscapes I’ve lived in and passed through in my home state. I don’t think I’m going to be able to get the charts up on the website for this one. I may at some point in the future. But the whole pattern is written out here, either way. a Blank squares in the chart are place holders that aren’t part of the pattern. + The increases are not spaced evenly throughout the pattern, so it might be difficult to add diameter just by doing more repeats. But if you want to try, you could probably get away with adding an 8 row repeat just after row 58. Start with repeating row 27 and then knit around repeating this pattern: sl1, k2tog, psso, k3, yo, k1, yo, k3. You could also probably repeat rows 78 through 93 before going on to row 94. Blue squares just mark the beginning of repetitions on the chart. Cast on: 10 stitches in the round. Repeat instructions for each round all the way to its end. Bind off: Insert crochet hook knit-wise into first stitch, and wrap yarn around hook as if to knit. Pull yarn through the stitch. Work the next stitch the same way, so you have two stitches on the hook. Wrap and pull yarn through both stitches. Continue working the next stitch from left needle and then pulling the loop through both stitches that leaves on the hook. At the end, break yarn and pull it all the way through the last loop. This is a good project for scrap yarn. I used worsted weight or a little lighter and size 4 or 5 needles. 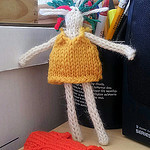 Basically, you want to use needles small enough for you to get a fairly tight fabric so you can stuff the doll without the stuffing showing or coming through the fabric. What you’ll need: A few yards of yarn, circular or double pointed needles for knitting I-cord and knitting in the round, a stitch holder, waste yarn or fluff for stuffing, darning needle for dealing with ends, and twist ties from a bread bag or what have you for making arms and legs poseable. Cast on 4 stitches and knit I-cord for 20 rows to make a leg (or however long you want it… that goes for all measurements). Set this leg aside on a stitch holder and repeat to make the second leg (if you like, you can cast on two sets of 4 stitches with two balls of yarn – or the two ends of one ball – and knit both legs at once). Once both legs are finished, put them on the same needle and knit across both with the same working yarn for 8 stitches total. Work a couple of twist ties into the legs if you want to make the doll poseable. If you have trouble, pull them through with a darning needle as if they were yarn. Separate the stitches on different needles or parts of your circulars for knitting in the round and join. Continue knitting for 10 rounds to make the body. Leave the tail of yarn left over from the first leg to sew up the crotch later. Start the I-cord arm with k1, k2tog, k1 to get to 3 stitches total. Continue knitting I-cord for 15 rows. Break thread and run the end of the yarn back through the stitches and pull tight to bind off. Put the next 4 stitches back on your needles and repeat arm instructions for second arm. This is where I like to go ahead and stuff a little fluff or waste yarn into the body. Then you can work twist ties (or one longer one) into the arms to make them poseable. For the head, pick up 4 stitches from arm to arm on the front of the doll and 4 stitches in back. K4, k1 front and back, k4, k1 front and back for 10 stitches total. K5, k1 front and back, k5, k1 front and back for 12 stitches total. Knit around until you think the head is big enough. I usually do two or three more rounds. You can even work more rounds of increases, if you like. Now or at the next row is a good time to stuff the head. K2tog all the way around to get 6 stitches total (if you made more increases, you will have to have more rounds like this, so take that into account when figuring out how big your doll’s head will be – either way, you want to end up with about 6 stitches). Run the yarn back through the stitches and pull tight to close the hole. Secure the yarn tightly (I like to run it back through the stitches again) and hide the end inside the doll. Stitch up the crotch and secure and hide all ends and you’re done! You can use thread or yarn to make a face, or you can draw it on with markers. 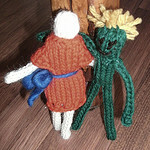 You can also add hair by tying bits of yarn of whatever length through the stitches around the head. Continue to knit around until the dress is as long as you’d like it to be. I worked a round of k2tog, yo just before casting off to create a little pattern at the bottom. Cast off and weave in the end. This is a pattern from 2005. It was on another post earlier that’s gone now. I’m having a heck of a time getting the chart on here. Sorry :) If it’s just showing up as letters for you, try downloading the font Knitting Symbols by CET. I originally knit this hat to match a sweater handed down to my daughter that was made for my husband by his aunt when he was a child. I’ve still got them packed away somewhere. Hopefully. My son wore the sweater, too, a little bit. The chart is numbered for knitting flat but I worked this pattern out in the round. If you knit it flat and then seam up the edges, you may want to add a selvedge stitch to one or both sides of the work — possibly in place of the column of purl stitches on the left side. The odd rows would be the wrong side and the even the right side. If you knit this cap in the round, read all the rows right to left. If you knit flat, just follow the numbers and knit the odd rows left to right. For any row not on the chart (most of the odd ones) knit into knit stitches and purl into purl stitches. Switch to larger needles and begin row 1 of the chart. This will be a wrong side row if you’re not knitting in the round. Repeat each row of chart one time for each row/round of the hat — the chart is 52 stitches wide, the cap is 104 stitches around. Bind off and sew up the top, or weave the sides together using kitchener stitch. To make sure the pattern matches at the top if you’re weaving it together, you’ll have to switch the last two stitches on each side to the other needle. Since some of the stitches will be purled, you’ll need to follow the kitchener pattern backwards for those. Instead of purling into the stitch on the front needle and later knitting it off the needle, for example, you’ll need to knit into those purl stitches and then purl them off like you would if it was on the back needle. When you get to the four stitches at the top of the diamond pattern, slip the first two on the front needle off onto a cable needle, hold them forward, and kitchener the next two. Then go back to the two on the cable needle to get the twist on the diamond at the top of the hat. Knit in the round from the center of the top down to the brim. Start out by swatching your yarn and measuring your head. I used bulky yarn and size 10 needles. I stretched the swatch to mimic a snug fit around my head (if you want a looser fit, don’t stretch) which gave me about 6 stitches over 4 inches or 1.5 stitches per inch. The measurement of where I wanted the brim of my tam to be on my head was 22 inches. Multiply the inches by the number of stitches per inch. In my example, it was 22×1.5=33. This is the number of stitches for the brim. Double the number of stitches for the brim to get the stitch count for the largest part of the hat. 33×2=66 for mine. Divide that number by 16 to get your cast on stitch count. 66÷16=4.125. I rounded down to 4 here and planned to make up any difference in stitch count at the decrease for the brim if I felt the need. If you’re using lighter weight yarn and your cast on stitch count is more than 8, you can divide that number by 2 and add another increase round at round 32. Cast on, spreading the stitches over 4 double points or on two or one circular needles, however you like to knit in the round. 2. Increase (also on rounds 4, 8, and 16): K1, yarn over (yo) to end of round. If you don’t want eyelet circles in the top of your tam, you can use any increase stitch you like instead of a yo. Knit around on all other rounds. By round 16 (or 32, if using lighter yarn) you should have reached your highest stitch count number. I was a little short at 64 stitches because of rounding down at cast on. 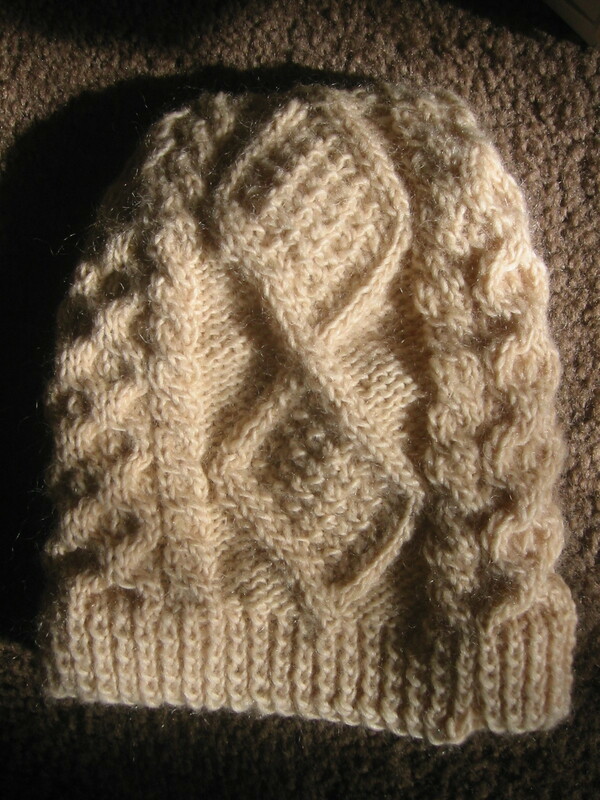 Knit until your hat measures 4 inches (more or less, depending on your taste) from the last increase round. Knit 2 together to end of round. If I had followed this, I would have ended up with 32 stitches, so I skipped the last decrease and knit both of the last two stitches separately to get 33. Knit another inch or so and bind off. This will create a rolled edge. If you’d like to do a knit 1, purl 1 ribbing, you could do that easily as long as your final stitch count is an even number. 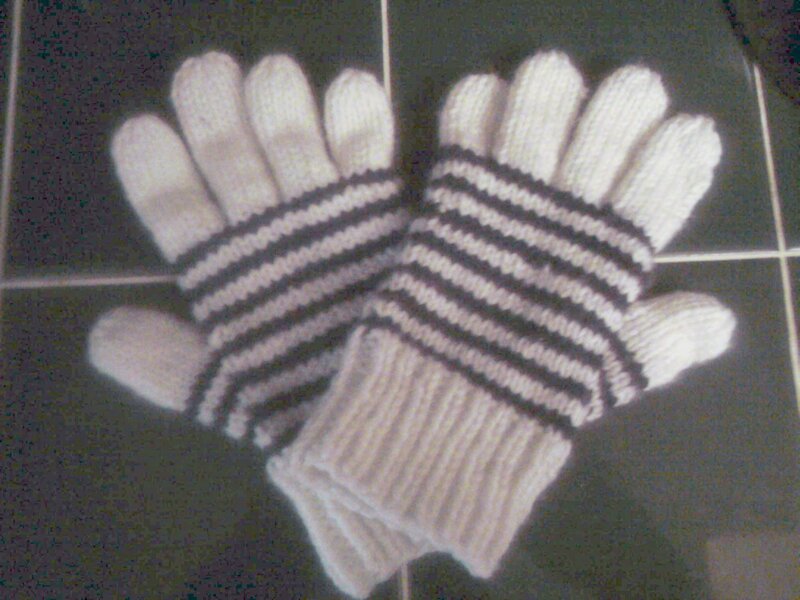 A pattern for medium to large kids’ gloves in worsted weight yarn on size 3.25mm (US3) needles. Put stitches on stitch holder, palm stitches facing one side and back of hand stitches facing the other. Use magic loop or 3 dpns for fingers and thumb. For 3 dpns, two needles will hold stitches and you’ll knit with the 3rd. Place 5 stitches on front needle and 4 stitches on back needle. Place 5 stitches on each needle.